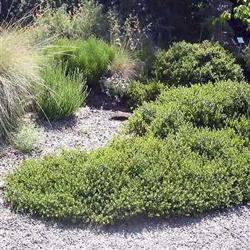 Emerald Carpet manzanita is an evergreen groundcover. It is a hybrid between Arctostaphylos uva-ursi and Arctostaphylos nummularia. Emerald carpet is drought tolerant and is popular in commercial landscaping. Its shiny dark green leaves, and red stems are complimented by cluster of white flowers in January and February, possibly earlier. This manzanita likes a rich, well- draining and acidic soil to look its best.